Hermann Muller was born in the USA on Dec 21 1890 of German heritage (his grandfather had emigrated from Germany in the mid 1850’s ).He studied at Columbia and then taught physiology at Cornell Medical College. His great passion however was genetics and he wanted to do research on Drosophila a field of study initially pioneered by the eminent scientist Thomas Morgan who was awarded the Nobel Prize in 1933 in medicine for his work on chromosomes and heredity. Julian Huxley the eminent biologist found Muller a job at the Rice institute , Houston where he started his pioneering work on mutations. From 1925 onwards he was Professor at Texas teaching genetics. In 1926 he discovered that radiation (xrays) caused gene mutations. This was to result in the Nobel Prize in Medicine in 1946. Muller was showered with numerous honours. Muller’s socialist and communist leanings are well covered in this book. His years of exile in Russia 1934-1937 are described including his fallout over Lysenko and the upsetting of Stalin. He returned to Edinburgh where he helped the career of many Indian scientists before returning to Amherst College USA. In 1945 he became a Professor of Zoology at Indiana, USA. He published many books including ‘The Mechanism of Mendelian Heredity’ with Morgan in addition to over 300 original papers. Meggitt’s biography of this fascinating maverick, scientific genius is a thoroughly researched account of a remarkable life and does not shirk from discussing the controversial aspects of his subject’s character and beliefs including the subject’s communist convictions and belief in eugenics. In the early days of X-rays people were not aware of its dangers. Muller’s legacy is that he showed in experiments that radiation was harmful and caused mutations and this knowledge has helped mankind deal with radiation with all the respect that this field deserves. Muller died in 1967. Reviewed by Dr Arpan K Banerjee, Chairman British Society for the History of Radiology. This new book from Italy is an interesting publication from the distinguished publishing house Springer which presents the results of analysis of over 1800 cases of bone pathology recovered from a recent archaeological excavation outside Rome. It is a truly multidisciplinary work involving orthopaedic specialists, radiologists, palaeopathologists, anthropologists and medical historians who have used scientific analysis including radiography and CT scanning to uncover information about the bones of Roman bodies from the first and second centuries AD unearthed from an excavation site from a Rome suburb. The scientific survey has unearthed fascinating, detailed information about ancient human osteology. Examples of infection including osteomyelitis, degenerative changes such as osteoarthritis and gout as well as of course trauma are all identified in specimens from 2000 years ago. In 1890, Professor Arthur Willis Goodspeed, a professor of physics at Pennsylvania USA was working with an English born photographer, William N Jennings, when they accidentally produced a Rontgen Ray picture. Unfortunately, the significance of their findings were overlooked, and the formal discovery of X-rays was credited to Wilhelm Roentgen in 1895. The discovery has since transformed the practice of medicine, and over the course of the past 130 years, the development of new radiological techniques has continued to grow. The impact has been seen in virtually every hospital in the world, from the routine use of Ultrasound for pregnancy scans, through to the diagnosis of complex medical issues such as brain tumours. More subtly, X-rays were also used in the discovery of DNA and in military combat, and their social influence through popular culture can be seen in cartoons, books, movies and art. Written by two radiologists who have a passion for the history of their field, The History of Radiology is a beautifully illustrated review of the remarkable developments within radiology and the scientists and pioneers who were involved. This engaging and authoritative history will appeal to a wide audience including medical students studying for the Diploma in the History of Medicine of the Society of Apothecaries (DHMSA), doctors, medical physicists, medical historians and radiographers. Montreal: DW Medical Consulting Inc. 2006 $20.00. This book started from an exhibition prepared by Dr. Del Maestro in collaboration with the Osler Library in Montreal to coincide with the 2006 Canadian Congress of Neurosciences and the book is the catalogue from the exhibition. The book is lavishly illustrated from the author's collection and is supplemented by material from the Osler Library. There are chapters on anatomy, neuro-surgery, medical imaging and therapy. The chapters are illustrated using classic papers. 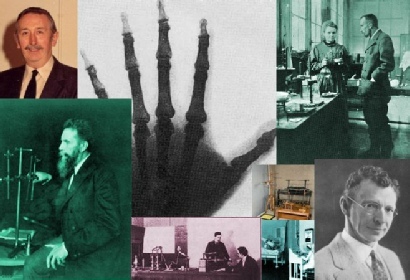 The European Society for Radiology, in cooperation with ISHRAD and the Deutches Roentgen Museum have published two excellent free books entitled The Story of Radiology to celebrate the International Day of Radiology. Click here for Volume 1 and here for Volume 2. This is an interesting biography of Arthur Stanley Eddington the Cambridge astronomer. Science and religion have long been thought incompatible and this is emphasised in the recent book 'The Grand Design' by Stephen Hawking. Science and religion was an interest of Silvanus P Thompson the Quaker physicist and first president of what became the British Institute of Radiology. The apparent contradiction between science and religion was fully resolved than in the life and work of Arthur Stanley Eddington (1882-1944) who was both a pioneer in astrophysics, in the theory of relativity, in the popularization of science, and who was also a devout Quaker. In 'Practical Mystic' it is shown how both religious and scientific values can interact and overlap without compromising the integrity of either. Lloyd Kemp was born in 1914 and studied Physics at King's College in London and joined the Medical Physics Department at the Royal London Hospital becoming head of the department in 1946. He moved to the National Physical Laboratory and was for his work was awarded the Röntgen Prize of the British Institute of Radiology and the OBE. Sadly his wife Mary suffered a stroke In 1968 which had profound effects on their life together. Mary died in 1988 . Whilst this book is about his life in medical physics, it is also trying to describe the growth of his concerns with broader and deeper aspects of life including the spiritual basis of life. 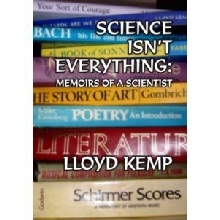 Lloyd Kemp will find himself in conflict with many scientists 'some of whom hold a near evangelical belief that science IS everything!' however his story is worth reading. Life is not easy and this book is an inspiring account of a one human's life and is worth reading. This is the third book by George Korankye who is a radiographer in Scotland. He is attempting to convince the publishing world to accept education fiction abbreviated to edufiction/edufic as a genre. An edufictional novel is intended to educate the reader in a particular field, and may also seek to promote awareness about its chosen topics. Although the narrative can be fictitious, all references must be verifiable. Whilst this may sound a recipe for a dry read this is not the case for 'Team Twenty Ten' which is a good read. I had my copy from Amazon (where else!). Philips Healthcare has bought some for promotion use. And there are a few left embossed with "courtesy Philips..." on Amazon .co.uk priced it £2.50. The proceeds will be going to charity. George is trying hard to raise the profile of radiographers and he cannot do so alone. Once again a TEAM effort is needed! The world needs exceptional people like Godfrey Hounsfield, Nobel Prize winner and inventor of CT but where do they come from? In this biography the authors have made a unique contribution toward answering this question. They have described how Hounsfield, a much liked man with modest education and indeed support, came to make his extraordinary personal breakthrough in medical physics with its universal benefit. Some biographies of genius have to plumb the dark corners of distorted or extraordinary backgrounds, but not here. What Hounsfield brought was exceptional intuition, dogged persistence and self belief. The book is well written in a relaxed style that quotes well-researched opinions of many who knew him and his work. The authors succeed in holding the reader's attention with a message of profound optimism and humanity. In "Radiation and Reason" Wade Allison explains, in simple terms and without using fancy maths, how radiation affects life. Wade is a Professor of Physics at the University of Oxford with 40 years experience of teaching these things. His account challenges the traditional view that nuclear radiation is very hard to understand and an extreme hazard. Modern scientific and medical evidence makes it obvious that this view is wrong -- but how dangerous is ionising radiation? Thanks to evolution, biology protects life very well and radiation is about a thousand times safer than suggested by current international safety standards. But you should see the evidence for yourself and make up your own mind by reading the book (see above). A little nuclear radiation is quite harmless and in a world of other dangers -- social and economic stability, global warming, population growth, shortages of power, food and water -- the pursuit of the lowest possible radiation levels is in nobody's best interest. Levels should be permitted as high as is relatively safe. Radiation, far from being a major cause of cancer, is one of its major cures through radiotherapy applied in every major hospital. Without justification great damage has been inflicted on public health and economic life in Japan as a result of the accident at Fukushima. Throughout the world the intention of many countries to abandon the use of nuclear power or load it with ever greater safety regulation and cost is unnecessary and even dangerous to the future of mankind. Evidently a complete change in world radiological safety is needed. The book is written by Claudia Clark, a historian from Central Michigan University. The books deal with the women workers who fell victim to radium poisoning in the early 20th century due to working with Radium paint. Many of the women worked at the Radium Dial Company in Ottawa, Illinois and they eventually suffered death from radium poisoning. The women were employed to paint the dials of watches with self-illuminating paint containing Radium. This book gives an account of their struggle to have their condition recognised as an industrial disease and is an important chapter in the history of modern health and industrial policy. Claudia Clark writes that part of what made dial-painting such an attractive job was working with a sensational product, a glow-in-the-dark paint. The women were assured that the radium based paint was completely safe and even digestible. Therefore the young women painted their dress buttons, fingernails, eyelids and even their teeth for fun. When they went home from work, they thrilled their families and friends with glowing clothes, fingers and hair. The book explains that the greatest exposure to radium was in the mouth and jaw area of these women. The workers mixed the luminous paint powder with paste and thinner and then drew their brush to a point with their lips before dipping it in the paint. The book is again recommended and resonates with the film Blond Venus. 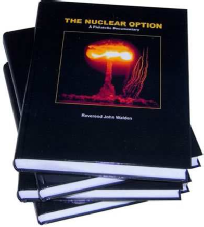 This beautifully produced book is written by the Reverend John Walden and deals with the discovery, development, tactical use, devastation and aftermath of the use of 'The Nuclear Option.' It has 560 pages, and is a full colour hardback of 23 chapters with 1,800 illustrations and weighs 2.1 kilos! There is an excellent accompanying CD which may be purchased. The book is beautifully illustrated and is recommended for all radiological philatelists. There are a very large number of stamps with a radiological or atomic theme. The Reverend John Walden MA, F.Inst SMM(Rt), APS is a British Combined Forces nuclear test veteran and he participated in the 1957 'Antler' series of nuclear tests in Maralinga, Australia. He is a retired Church of England Pastor and now lives in Norwich. He has been a philatelist for over 60 years, and is the current President of the Norfolk & Norwich Philatelic Society. IFor the Victorians, electricity was the science of spectacle and of wonder. It provided them with new ways of probing the nature of reality and understanding themselves. Luigi Galvani's discovery of 'animal electricity' at the end of the eighteenth century opened up a whole new world of possibilities, in which electricity could cure sickness, restore sexual potency and even raise the dead. In "Shocking Bodies", Iwan Rhys Morus explores how the Victorians thought about electricity, and how they tried to use its intimate and corporeal force to answer fundamental questions about life and death. Some even believed that electricity was life, which brought into question the existence of the soul, and of God, and provided arguments in favour of political radicalism. This is the story of how electricity emerged as a powerful new tool for making sense of our bodies and the world around us. This book is interesting and looks mainly at the cultural implications of medical imaging. I find the interface between medical imaging and popular culture very fruitful. From the Amazon review: "From the potent properties of X rays evoked in Thomas Mann's "Magic Mountain" to the miniaturized surgical team of the classic science fiction film "Fantastic Voyage", the possibility of peering into the inner reaches of the body has engaged the twentieth-century popular and scientific imagination." "The Transparent Body" considers the dissemination of medical images into popular culture. The interior of the body has become a pervasive and common cultural presence. Jose van Dijck explores the interactions between medical images and our cultural ideologies and again this book is recommended. Autobiographies written by radiologists are few and far between. Few radiologists have chronicled their own life stories. It is therefore a great pleasure to find this new radiology autobiography written by a true giant of interventional radiology. Josef Rosch who was born in 1925 in Czechoslovakia has chronicled his amazing life story in this slim volume. It is a delight to read and is likely to inspire the next generation of interventional radiologists. Rosch was inspired to do radiology by his inspirational radiology teaching during medical student days having initially intended to be a physician. Between 1954 and 1967 he carried out research on angiography in Prague. In 1967 he moved to Oregon on a research fellowship to work with Charles Dotter, the angiography pioneer. The pioneering work on gastrointestinal bleed embolization, thrombolysis, pharmacoangiograhy and TIPS( transjugular intrahepatic portosystemic shunt) and expandable metallic stents carried out there is described. Rosch chronicles his friendship with Judkins, Dotter and Bill Cook (owner and President of Cook Medical) amongst many other friendships. He mentored generations of future leaders in their fields. The founding of the Dotter Interventional Institute in 1990 is described along with his subsequent new fellows and research which continued well into his retirement years. Rosch has had a brilliant career in this new field and can lay claim to be one of the true pioneers of this subject. His phenomenal industry , prolific research output and work ethic come through in this slim volume. All who read it will be inspired by his remarkable story and his outstanding contribution to the new field of medicine. Reviewed by Dr Arpan K Banerjee Past Chairman British Society for the History of Radiology. This slim volume is a publication from the Springer Biography series. The last contribution in the series I read was the superb autobiography of Rosch the interventional radiology pioneer. This biography is of Louis Harold Gray the British physicist and a giant in the field of radiobiology which is the basis of modern radiotherapy. Hal Gray as he was known was born in London in 1905 an only child educated at Christ’s Hospital and subsequently the physics department at Cambridge University where he was taught by Rutherford. He was a brilliant student and continued to do a PHD at the Cavendish labs under the supervision of Chadwick discoverer of the neutron and a Nobel Laureate. Gray was interested in nuclear physics and was interested in how ionising radiation could treat tumours. He moved to Mount Vernon Hospital to pursue his interests as hospital physicist. He used a neutron generator to measure ionising effects on tissues. After the War he moved to the MRC Radiotherapy research unit at the Hammersmith Hospital where his team did much pioneering work. In 1949 he became President of the British Institute of Radiology. Sadly, after differences with his boss at he MRC unit he had to leave the Hammersmith Hospital in 1953 and returned to Mount Vernon where he built a superb world famous radiobiology unit. He did much travelling in the late 1950’s when he was at the height of his fame. Gray was elected Fellow of the Royal Society. Gray’s stroke is described and he sadly passed away in 1965 aged only 59. In 1975 he was honoured by having the absorbed dose of radiation named after him. This well researched biography is a delight to read and tells the story of a remarkable scientist whose contributions laid the foundation stones for future radiotherapy.